If there are other things that you need pictures about, just email me. How to Login and Succeed at this Course - Also sent by email before the Course opens. 2. You see a Login Here section on the left. Before you login, notice the upper right section of the screen with the link Help & Resources. You will use that link to make sure your computer and browser work with this Blackboard. FYI: I care about you all, but I am not a techy. WCJC’s IT can help (at Help & Resources). My 1 tech tip is—if your browser is not working or displaying what I say is there—try a different browser for a day. 3. Follow the directions in the Login Here section for what you type in those 2 fields. 4. Login on the Blackboard log in screen. 5. On the left side of the new screen see the words My Courses. 6. Look for our course and click on it. Tip: the naming conventions for Blackboard courses have changed so you may have trouble guessing our course. 7. 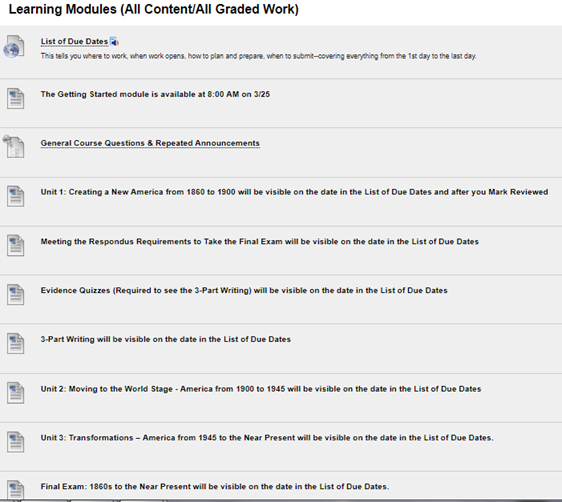 What you see when you click on the course varies with when you log in. · If you log in in during Getting Started, Blackboard automatically displays Read Me First and the Getting Started Learning Module. · If you log in after Getting Started has ended, Blackboard displays the Home Page and a list of Announcements. 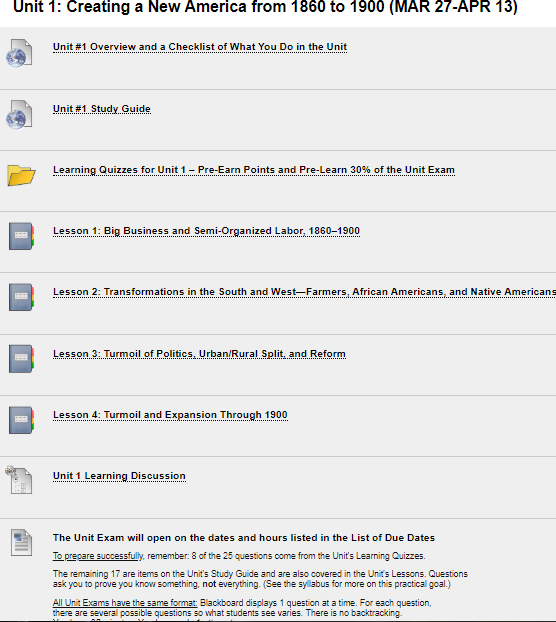 Caution: You need to click on Learning Modules and then Getting Started and do the tasks there. Also, if you did not or cannot finish the Getting Started work before the date in the List of Due Dates, email your instructor in Course Messages (Blackboard’s email) for what to do. 8. When you are ready to start history work, click on Learning Modules on the Course Menu and then Unit 1. The Director of Distance Education at WCJC encourages students never to use what is called Blackboard’s Global Navigation. The students that I have seen fail horribly used this tool in the upper right area next to the log out button. Students thought they were failing because they clicked on something they thought was My Grades. Other students seem to think that they can click and go. They skip the instructions so they frequently fail and sometimes do work they did not need to do. Blackboard does not record that you are in the class so—as far as your instructor knows—you are not in the course. < Office hours, contact information – Ask! I am glad to help you. <Blackboard’s tool for public communication or public submission of writing by students. < Blackboard’s tool for personal communication, such as feedback on your writing. < Blackboard’s tool for public news. < Blackboard’s tool for your personal view of your grades in the Gradebook. · College links, such as to Disability Services. The Learning Modules page not only gives you access to whatever is listed in the List of Due Dates, but gives you reminders of what we will be available on the date in the List of Due Dates. For example, this screen was made before the course opened. At 8:00 AM, that first item will be gone and you will see the actual Getting Started module. The word everything on the right side of the page means instructions, all content, all tools, and a discussion so you can ask (and answer) questions to get help and to get points. All Units are organized in exactly the same way. How Do You Know What to Do Where and When? What’s All This Stuff about Self-Tests and Full-Tests: How Do They Look? Units begin with a quiz on common concepts in history that freshman students commonly do not know. Notice the Self-Test is still there—and you cannot retake it, but you can still look at and you should. Why? You need to know what you know and what you have to learn. Notice there is additional material to help you teach yourself and below that the Full-Test you can retake as many times as you want—with the highest score counting. What’s All This Stuff about Self-Tests and Full-Tests: How Do They Work to Help You? One of my favorite thinkers about learning says that what make the difference for learners is their knowing what they know and do not know. This course tries to make it possible for you to learn what you do not know without cost to you in your grade. Here’s what the syllabus says about how they work to help you. Tip: On the other hand, it is in your interest to answer Self-Tests accurately so measure your own brain accurately for 2 reasons. 1. You want to know what you know and do not know to save time and to correct or complete what you do not know. Caution: With Evidence Quizzes, this is particularly important because, if you miss many questions, you must follow instructions carefully because writing about history is different from your prior experiences. 2. If you already know the content in the Self-Test and prove that by being correct on over 80 percent of the questions on that Self-Test, you earn the points for its Full-Test without taking it. Your instructor enters those points at the end of each Unit after the Learning Quizzes close. · Once you submit the self-test, Blackboard automatically displays additional content (if needed) and a Full-Test so that you can earn full points while teaching yourself the vocabulary and map locations that you do not know. You may repeat as many times as you wish, and your highest score counts. You are right 80% or more of the questions. You are right 79% or fewer of the questions. Jot down what you missed—not the whole question but brief words. Tip: You can always go back to look at the Self-Test again. Blackboard sometimes displays resources, such as dictionary definitions. If you made more than a 0, Blackboard always displays the Full-Test. If Blackboard does not display the Full-Test, you made a 0 on the Self-Test. (Tip: You can confirm that at My Grades.) Email bibusc@wcjc.edu with your name, class, and the exact name of the Self-Test. I will reply back that I deleted the 0 so you can take the Self-Test. If you want to, you may take the Full-Test. You take its Full-Test until you understand. your instructor enters Full points for you. because you already knew it. The list of tasks for Getting Started is the same one in the Course Plan that you complete during Getting Started. Respond to Before the Class Opens email according to the directions. Post your Introduction in the Discussion available from Getting Started. Complete Your Course Plan for Your Grade and submit it in its Blackboard Assignment. Caution: If the total of the assignments and the letter grade you choose do not match, you will have to do this over. You are only as good as your plan. Complete the Searchable Syllable Assignment and submit it in its Blackboard Assignment. Caution: Be sure you look at the links in that Searchable Syllabus. This is what I would show you if I could sit with you so you could know how to succeed.